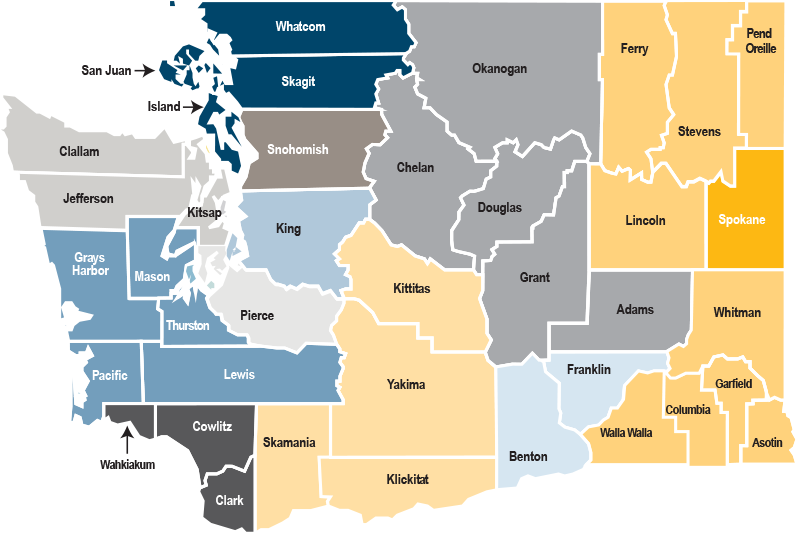 Narrow your search by area, office and services. 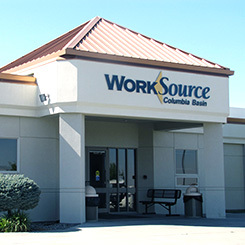 If you select no location, office or service, all WorkSource offices will be listed. The more you narrow your search, the fewer options you will see. 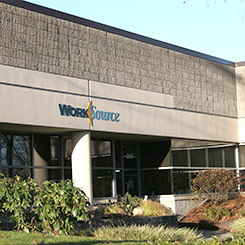 WorkSource locations that provide all services you select will appear on the right. 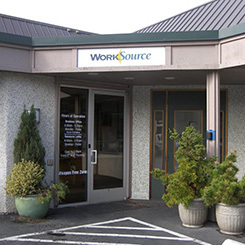 Office type: WorkSource center - All employment and training services available on site. Hours: Monday & Thursday, 8 a.m. - 5 p.m., and Tuesday, Wednesday & Friday 9 a.m. - 5 p.m. 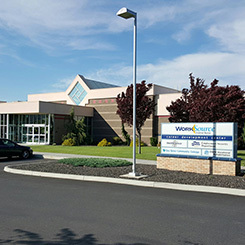 Hours: Monday, Tuesday, Thursday, & Friday 8 a.m. - 5 p.m., and Wednesday 9 a.m. - 5 p.m.
Office type: WorkSource affiliate - Most employment and training services available on site. Others available electronically. Hours: M-TH 7:30 a.m.-12 p.m., 1 p.m.-4:30 p.m. Friday 9 a.m.-12 p.m, 1 p.m.-4:30 p.m. 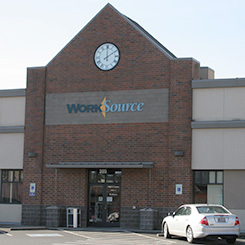 Hours: M-F, 8 a.m. - 12 p.m.
Office type: WorkSource connection - Electronic connections to most employment and training services. Some available on site. Hours: This office is open by appointment only. 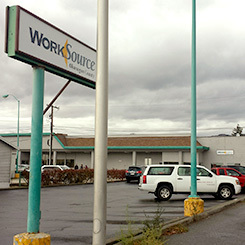 Please visit WorkSource Colville (956 S. Main, Suite B, Colville, WA 99114) for walk-in service. Hours: M-F, 8 a.m. -5 p.m. Hours: M-TH, 8 a.m. - 5 p.m., FR, 8 a.m. - 4 p.m. Hours: M, W-F, 8 a.m. - 5 p.m. and Tuesday 9 a.m. - 5 p.m. Hours: M, W-F, 8 a.m. - 5 p.m. and Tuesday 9 a.m. - 5 p.m. 2nd and 4th Thursday each month, 8 a.m. – 7 p.m. Hours: M-F, 8 a.m. - 12 p.m., 1 p.m. - 5 p.m. 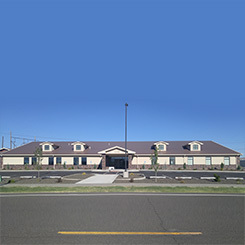 Hours: M-Th, 8 a.m. - 5 p.m., Fri 9:00 a.m. - 5:00 p.m. 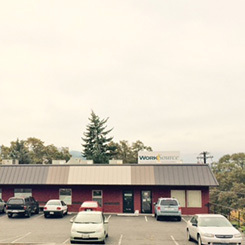 Hours: M-Th, 8 a.m. - 5 p.m., Fri 9 a.m. - 5 p.m. Hours: M-F, 8 a.m. -4:30 p.m. Hours: M-Th, 8 a.m. - 4:30 p.m. Hours: M-F, 9 a.m. -5 p.m. Hours: M-Th, 9 a.m. - 4 p.m. Hours: M-F, 9 a.m. - 12 p.m., 1 p.m. - 4 p.m. 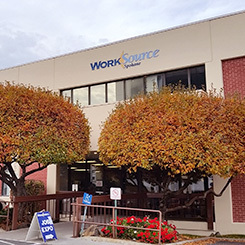 Hours: M-F, 8 a.m. - 4 p.m.
Office type: WorkSource affiliate - Most employment and training services available to job seekers with base access. Others available electronically. Hours: M-W, 8a.m. - 5 p.m.; Th, 10 a.m. - 5 p.m.; F, 8 a.m. - 5 p.m. Hours: M, Tu, Th, F, 8 a.m. - 5 p.m., Wed 9 a.m. - 5 p.m. Hours: M-F, 8:30 a.m. -5 p.m. 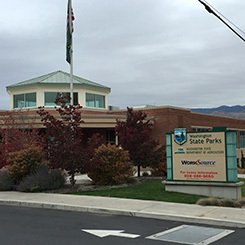 Hours: M-W and F, 8 a.m. - 5 p.m. Thursdays, 9 a.m. - 5 p.m.
Office type: WorkSource affiliate - with Youth focus - Most employment and training services available on site. Others available electronically. Hours: M-F 8 a.m. – 3 p.m. 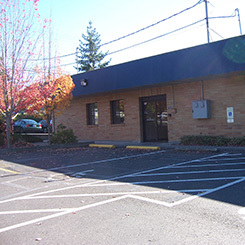 Hours: M-Th, 8 a.m. - 5 p.m.; F, 9 a.m. - 1 p.m.
Office type: WorkSource connection - Foodbank and emergency services - Electronic connections to most employment and training services. Some available on site. Hours: M-F 8:30 a.m. – 5 p.m. Hours: Due do the field-based nature of IKRON’s work, please call ahead before visiting this site. Hours: W-F 9 a.m. – noon. Only open to current clients. Please contact for eligibility. Hours: M-F 7:30 a.m. – 4:30 p.m. Hours: M-F 6:30 a.m. – 2 p.m.; Sa 6:30 a.m. – 10 a.m. Hours: M-F 10 a.m. – 5 p.m. 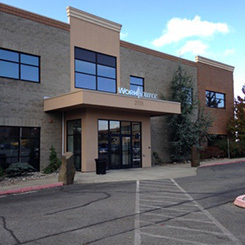 Hours: M-Th 8:30 a.m. – 8 p.m.; F 8:30 a.m. – 5 p.m. Hours: M-Th 9 a.m. – 6 p.m. Hours: M-F, 8:30 a.m. - 5 p.m. Hours: M-Th 10 a.m. – 8 p.m.; F-Sa 10 a.m. – 6 p.m.; Sun 1 p.m. – 5 p.m. Hours: M-Th 10 a.m. – 8 p.m.; F-Sa 10 a.m. – 6 p.m.; Su Noon – 6 p.m. Hours: M-F 9 a.m. – 4 p.m. 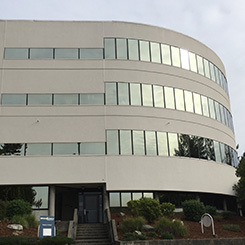 Hours: MTWF, 8 a.m. - 5 p.m.; Th, 9 a.m. - 5 p.m.
Office type: WorkSource center - A sub-section on WorkSource Everett, focusing on providing services to youth. 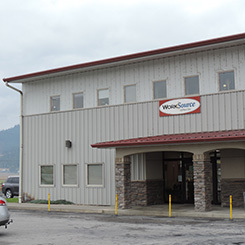 All employment and training services available on site. Hours: MTuWF, 8 a.m. - 5 p.m.; Th, 9 a.m. - 5 p.m.
Office type: WorkSource affiliate - Most employment and training services available on site. Others services available electronically. Hours: M-T-Th-F, 8 a.m. - 5 p.m.; Wed 9 a.m. - 5 p.m. Hours: M-Th, 8 a.m. - 12 p.m. and 1:00 p.m. - 5 p.m. Fridays, 8 a.m. - 12 p.m. and 1:00 p.m. - 4 p.m. Hours: M-Th, 8 a.m. - 5 p.m. and Friday 8 a.m. - 4 p.m. Hours: M-Th, 8 a.m. - 5 p.m. Fridays 8 a.m. - 4 p.m. Hours: Tuesday – Thursday from 9am – 4pm, Monday and Friday mornings by appointment only at this time. Hours: M-Th, 8 a.m. - 5 p.m. Fridays, 8 a.m. - 4 p.m. Hours: Monday, Tuesday, Thursday, & Friday 8 a.m. - 5 p.m.; Wednesday, 9:30 a.m. - 5 p.m. Hours: M-Th, 8 a.m. - 5 p.m.; F, 9:30 a.m. - 5 p.m. 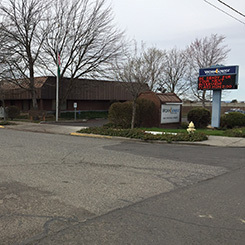 Hours: MThFS, 10 a.m. -6 p.m.; TuW, 10 a.m. - 8 p.m. Your current saved office is [%WSOfficeCurrent%]. Are you sure you want to change it to [%WSOfficeNew%]? 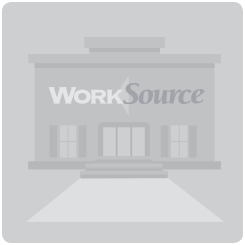 Are you sure you want to remove your saved WorkSource Office?